The blood supply to the brain is supplied by 4 arteries: 2 vertebral arteries and 2 internal carotid arteries. The 2 vertebral arteries goes into the skull via the foramen magnum and link at the lower border of the pons to create the basilar artery, which ascends in the midline on the ventral surface of the pons and at its upper border ends by dividing into left and right posterior cerebral arteries. Every internal carotid artery enters the cranial cavity via carotid canal and the superior part of the foramen lacerum. It then takes a sinuous course via the cavernous sinus, pierces the dural roof of the sinus and finishes immediately lateral to the optic chiasma in the region of anterior perforated substance by breaking up into a bigger middle cerebral artery and a smaller anterior cerebral artery. The branches of basilar and internal carotid arteries anastomose at the base of brain around the interpeduncular fossa creating a 6 -sided polygon of arteries termed circulus arteriosus or circle of Willis. The circle of Willis is located in the interpeduncular subarachnoid cistern and gives the majority of the arterial blood supply to the brain. Anteriorly, by the anterior communication and the anterior cerebral arteries. Posteriorly, by the basilar artery splitting into 2 posterior cerebral arteries. Laterally on every side, by the posterior communicating artery joining the internal carotid artery with the posterior cerebral artery. 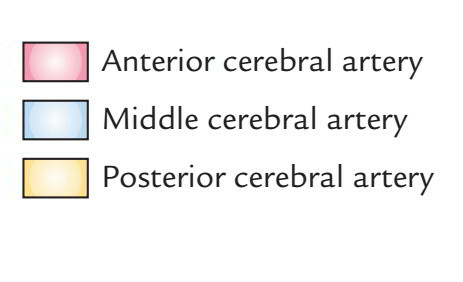 Normally there’s little or no mix of blood streams of (a) 2 vertebral arteries in the basilar artery, (b) 2 anterior cerebral arteries in the anterior communicating artery and (c) internal carotid and posterior cerebral arteries in the posterior communicating artery. For that reason, right half of the brain is supplied by right vertebral and right internal carotid arteries and left half of the brain is supplied by left vertebral and left internal carotid arteries. But if 1 of the major arteries creating the circle of Willis is obstructed, the circle of Willis gives the different alternative routes for collateral circulation like an arterial traffic circle. These take place largely at the sites where 2 arteries join in the formation of the circle of Willis. The basic abnormality at these points is the congenital lack of the tunica media (elastic tissue) in the arterial wall. The aneurysms are berry shaped, for this reason they’re usually referred to as berry aneurysms. The subarachnoidhemorrhage generally, but not alone, results from rupture of congenital berry aneurysms in the interpeduncular cistern. The subarachnoid hemorrhage generates a sudden acute pain in head followed by mental confusion. The departure may immediately take place, or the patient may live the very first bleeding only to die a couple of days or weeks afterwards. Posterior spinal artery (first intracranial branch) appears from vertebral artery and occasionally from posterior inferior cerebellar artery. It enters downwards on the posterior surface of the spinal cord after breaking up into 2 branches; 1 along the medial side and the other along the lateral side of the dorsal roots of the spinal nerves. Posterior inferior cerebellar artery is the largest branch of the cranial (4th) part of the vertebral artery. 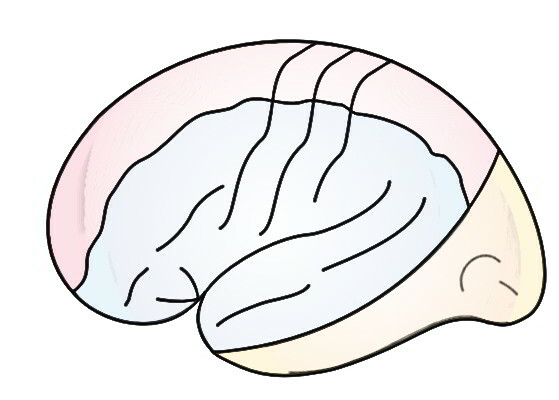 It originates near the lower end of the olive, winds backwards around the medulla oblongata and after that ascends to the pontomedullary junction. Anterior spinal artery is a small branch. It appears near the conclusion of the vertebral artery. It descends in front of the medulla and unites with its fellow of the opposite side-the lower end of the olive to create one median trunk that descends along the anterior longitudinal fissure of the spinal cord. Meningeal branches are small and supply the dura mater of the posterior cranial fossa. Medullary arteries are several tiny vessels which supply the medulla oblongata. Pontine branches are numerous short, slim paramedian vessels, which pierce the pons to supply it. Anterior-inferior cerebellar artery appears close to the lower border of the pons and run backwards and laterally normally ventral to the 7th and 8th cranial nerves. Afterward it creates a loop over the flocculus of the cerebellum and peeps into the internal acoustic meatus for a varying space being located below the 7th and 8th cranial nerves. After exit from the meatus, it supplies the anterolateral portion of the inferior outermost layer of the cerebellum. Labyrinthine artery is a long slim branch which originates either from basilar artery or from anterior-inferior cerebellar artery. It accompanies the vestibulocochlear nerve and enters the internal auditory meatus to supply the internal ear. Superior cerebellar artery appears near the superior border of the pons, runs laterally below the oculomotor nerve (that is interposed between this artery and the posterior cerebral artery) and winds round the cerebral peduncle below the trochlear nerve to get to the superior outermost layer of the cerebellum, which it supplies. Posterior cerebral artery enters laterally along the superior border of the pons parallel to the superior cerebellar artery, curves around the midbrain to get to the medial surface of the cerebral hemisphere below the splenium of corpus callosum. The artery produces central branches into the ventral outermost layer of the midbrain and temporal lobe of the corresponding cerebral hemisphere. Afterward it enters in the direction of the occipital post supplying cortical branches. Ophthalmic artery originates from internal carotid artery immediately after it comes out of cavernous sinus and makes a U-shaped curve. The ophthalmic artery enters the orbit via optic canal to supply structures of the orbit consisting of eyeball. Posterior communicating artery originates near the conclusion of the internal carotid artery. It runs backwards and anastomoses with the proximal part of the posterior cerebral artery. Anterior choroidal artery is a long thin branch, which originates just distal to the origin of the posterior communicating artery. It lessons backwards above and along the optic tract to go into the inferior horn of the lateral ventricle via the choroid fissure to finish in the choroid plexus. Because of its long subarachnoid course and a comparatively small lumen, the anterior choroidal artery is the most prone to thrombosis and is frequently called artery of cerebral thrombosis. Anterior cerebral artery is a smaller terminal branch of the internal carotid artery. It runs forwards and medially above the optic nerve to the commencement of the median longitudinal cerebral fissure, where it comes quite close to its fellow of the opposite side and gets joined with it by a brief transverse anterior communicating artery. The anterior cerebral artery then arch around the genu of corpus callosum. 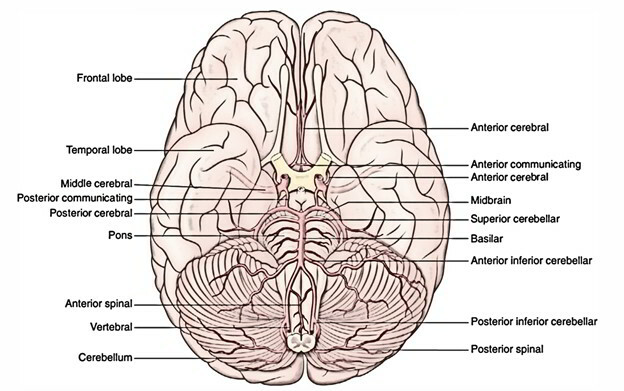 The branches given off just distal to the anterior communicating artery supply the medial part of the orbital surface of the frontal lobe. The artery continues along the upper surface of the corpus callosum and supplies branches which supply all of the medial surfaces of the hemisphere above the corpus callosum as much back as the parieto-occipital sulcus. 5. Middle cerebral artery is the bigger terminal branch of the internal carotid artery. It seems to be the direct continuation of the internal carotid artery and carries about 30% of the carotid blood circulation. 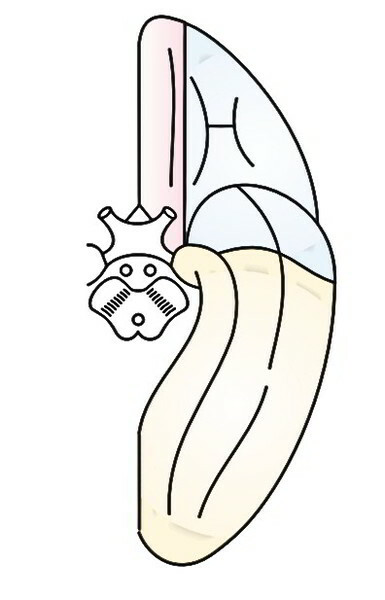 The middle cerebral artery first runs laterally in the stalk of the lateral sulcus and after that turns backwards and upwards in the posterior ramus of the lateral sulcus, where it breaks up into frontal, parietal and temporal branches, which come from the lateral sulcus and run in the direction of the regions of their supply. It’s been noticed that every principal artery supplying the brain produces 5 sets of branches, hence making a total of 15 sets, out of which there are 3 pairs of cerebral arteries (anterior, middle and posterior) and 3 pairs of cerebellar arteries (posteroinferior, anteroinferior and superior). Cerebral thrombosis most commonly changes the middle cerebral artery or its primary branches because it’s a direct continuance of the internal carotid artery. The cerebrum is supplied by 3 pairs of cerebral arteries, viz. anterior, middle and posterior. The cerebral arteries give 3 types of branches, viz. The cortical vessels freely anastomose and create a network in the pia mater on the face of the cerebral cortex. From this network branches pierce the cortex at right angle and originate from. They become the end arteries as soon as they go into the cerebral cortex. The cortical branches supply the outer portion of the cerebrum. Anterolateral group (lateral striate arteries). Middle cerebral artery: Majority of the superolateral surface (about 2/3rd) is supplied by the middle cerebral artery. The region of cerebral cortex furnished by it consists of the greater parts of primary motor and sensory regions and frontal eye field. In the left (dominant) hemisphere it contains the Broca and Wernicke’s language regions. Anterior cerebral artery: A narrow strip of the cerebral cortex (about 2.5 cm in width) adjoining superomedial border up to the parieto-occipital sulcus is supplied by anterior cerebral artery. The upper parts of primary motor and sensory regions are located in this region. Posterior cerebral artery: A narrow strip along the lower border of temporal lobe (excluding temporal post) and occipital lobe are supplied by posterior cerebral artery. The posterior parts of visual area autumn in this area. Anterior cerebral artery: The majority of the medial surface (anterior 2/3rd) is supplied by the anterior cerebral artery. The region of cerebral cortex supplied consists of the parts of motor and sensory regions (paracentral lobule) concerned with perineum, leg and foot. Middle cerebral artery: Temporal post of the temporal lobe is supplied by the middle cerebral artery. Posterior cerebral artery: Occipital lobe is supplied by the posterior cerebral artery. The area supplied contains the visual cortex. Posterior cerebral artery: The majority of the inferior surface with the exception of the temporal post is supplied by the posterior cerebral artery. 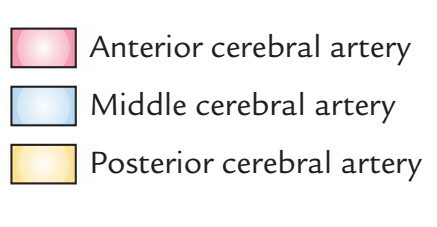 Middle cerebral artery: Lateral part of the orbital surface of the frontal lobe and temporal post of the temporal lobe are supplied by the middle cerebral artery. Anterior cerebral artery: Medial part of the orbital surface of the frontal lobe is supplied by the anterior cerebral artery. Every surface of the cerebral hemisphere is supplied by 3 cerebral arteries, viz. anterior, middle and posterior. Majority of the superolateral surface is supplied by middle cerebral artery, the majority of the medial surface by the anterior cerebral artery and the majority of the inferior surface by the posterior cerebral artery. 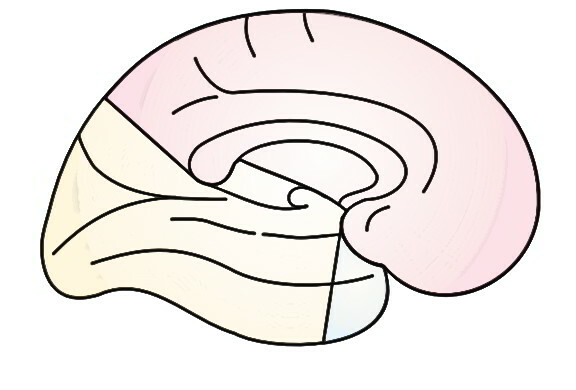 The corpus striatum and internal capsule are supplied primarily by the central branches of middle cerebral artery and to some degree by the central branches of anterior cerebral artery. The thalamus is supplied primarily by the central branches of posterior communication, posterior cerebral and basilar arteries. The midbrain is supplied by the posterior cerebral, superior-cerebellar and basilar arteries. The pons is supplied by the basilar, superior cerebellar and anterior inferior cerebellar arteries. The medulla oblongata is supplied by the vertebral, anterior spinal, posterior spinal, posterior-inferior-cerebellar and basilar arteries. The cerebellum is supplied by the superior, anterior-inferior and posterior inferior cerebellar arteries.